This is for anyone who’s fed up of tucking into yet another sandwich for lunch and then fading into an afternoon slump. 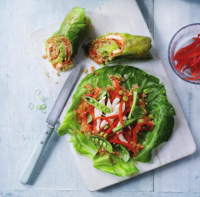 As an alternative, these wraps are tasty, filling, energising, and easy to carry and eat on the go. Pick up a copy of Waitrose Kitchen magazine in store for even more delicious meal ideas and our latest winter recipes. 1. Preheat the oven to 200˚C, gas mark 6. Put the chicken breasts in a deep ovenproof dish, cover with just-boiled water and cook in the oven for 30 minutes. Check the chicken is cooked through and no pink meat remains, then transfer to a plate and leave to cool. 2. Meanwhile, for the salsa, put the peppers on a foil-lined baking tray and drizzle with 1 tbsp olive oil. Roast for 30 minutes, until blackened slightly. 3. Cook the quinoa according to pack instructions; drain and set aside to cool. 4. Put the cabbage leaves in a large bowl, cover with just-boiled water and leave for 2 minutes. Remove and pat dry with kitchen paper. Cut away the woody end of the stems; set aside. 5. To finish the salsa, heat the remaining oil in a pan. Fry the onion for 5 minutes until softened, then add the garlic and chilli and cook for 1 minute more; season. Peel the skin from the cooled pepper and discard it along with the seeds. Put the flesh in the small bowl of a food processor along with the onion mixture. Blitz until smooth, then stir 2/3 of the mixture into the quinoa, along with the basil and salad onions. Set the remaining salsa aside. 6. Slice the poached chicken into long strips, season and set aside with the sugar snap peas and red pepper. 7. Now start rolling. Take a cabbage leaf and spread about 1/4 of the quinoa evenly over it, leaving a 2cm border around the edges. Spoon a little of the remaining salsa down the centre, then a few strips of chicken, sugar snaps and red pepper. Firmly roll each cabbage leaf around the filling, tucking the edges in. Repeat with the remaining ingredients to make 4 rolls. 8. If you are eating straight away, slice the roll down the middle. If you are preparing it for lunch the next day, wrap in clingfilm and refrigerate overnight. More info: 27.5g protein, 7g fibre.